Students who are bullies in year seven are also likely to become victims in high school, Flinders research has found. A new study of 1,382 students across three cohorts found that children who were bullies or victims of bullying in year seven were at higher risk of playing the same roles between year eight and eleven. Lead author Dr. Grace Skrzypiec, from the Flinders University Student Wellbeing and Prevention of Violence (SWAPv) Research Centre, says that while some kids continue to bully or fall victim to bullying, "new victims and bullies emerged during each year of high school." 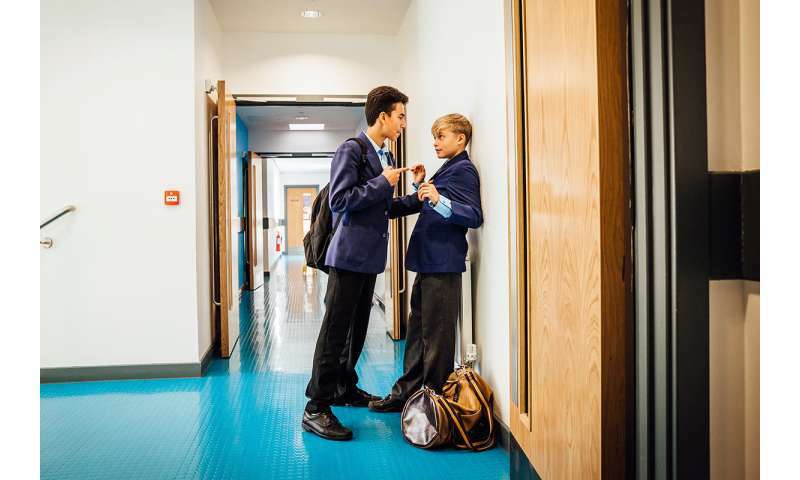 The year seven bullies were found to have a 40.5 percent chance of being bullies at some point from years eight to eleven, while students who had nothing to do with bullying only had a 10.7 percent chance. Victims of bullying in year seven had a 56.3 percent chance of becoming victims from years eight to eleven, while those not involved in bullying then had only a 17.5 percent chance. The chance of year seven bullies becoming victims in high school was also high at 54.9 percent. Students' overall risk of being affected by high school bullying by year eleven was 16 percent for being a bully, 36 percent for being a victim, and 13 percent for being a bully-victim: someone who has both bullied others and been bullied. Boys were over three times more likely than girls to be a bully in at least one year from years eight to eleven, while girls and boys were equally likely to be victims. "While these statistics help us to understand the complexities of being involved in bullying in high school as a victim, bully or both, it is critical that we avoid placing labels on students or singling out individuals," Dr. Skrzypiec says. "Rather, this knowledge should be used to design programs that enhance positive, age-appropriate student relationships for all students throughout high school." Dr. Skrzypiec suggests this may relate to the maturity gap: the tendency of adolescent boys to develop later than girls in brain development for social skills and inhibition. The proportion of students who were bullies in each year level from seven to eleven was similar, suggesting that while new bullies emerge each year, some stop as well. The study has important implications for bullying prevention, Dr. Skrzypiec says. "On the one hand, students' frequent lapse into their primary school roles in high school suggests that schools should pay special attention to students' former involvement in bullying during the transition from primary to high school," she says. "At the same time, the emergence of new bullies and victims each year suggests that anti-bullying interventions should continue throughout high school, adapted for each age group." "It is important to nuance types of bullying prevention interventions, taking into account the intensity and severity of the bullying, and the understanding that older students are more likely to seek the support of peers rather than teachers or parents," says Dr. Skrzypiec. The paper, "Involvement in bullying during high school: A Survival Analysis approach," has been published in Violence and Victims Volume 33, Number 3, 2018.